Security and compliance were widely discussed at Office 365 Saturday Vancouver (formerly SharePoint Saturday) this past weekend. Here are three speakers who caught our ear with points relevant to knowledge and records management, and in particular the new capabilities inherent in Office 365 labels. Critical for GDPR compliance, he described the “multi-geo” capabilities in Office 365, allowing administrators to select where data is stored across data centers around the world on a per-user basis. Existing Office 365 tenants can be extended to different data centers in different geographies. Her best practice approach for deploying labels with Office 365 begins with identifying the classifications you want for your labels. Develop your approach and test it with a small group before rolling it out to the broader organization. Joanne described the security capabilities that labels enable. Administrators can restrict access rights including viewing, printing, and downloading; for highly classified documents the user won’t even be able to take a screenshot. There is a geography lesson here too: admins can see exactly where in the world a file was opened—including any that have been forwarded—and revoke access remotely. 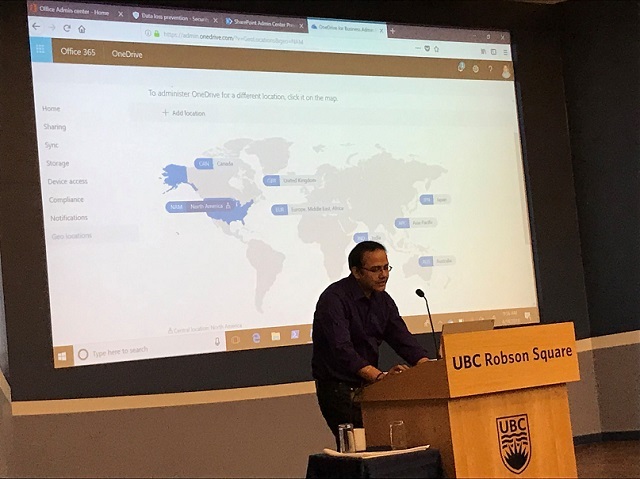 Colligo’s Riyaz Lakhani, who leads our Product Management team, spoke on Advanced Data Governance in Office 365 with Labels. Within the O365 Security & Compliance Center, Microsoft recently released a set of new advanced data governance features allowing administrators to tag and retain content across all O365 workloads (Exchange, SharePoint, OneDrive etc.). Riyaz introduced the concept of labels and reviewed the steps used in creating a label, including automated labeling and manual labeling of content, applying retention policies, and publishing a label to a certain O365 workload. We’ll be going into all of this and more again in our upcoming webinar (see below). The move to Office 365 & SharePoint creates enormous possibilities for Records Managers—ones that will effectively transform how your organization captures and stores information. On April 23 we co-hosted a webinar with MVP Robert Bogue to share how to apply Microsoft’s game-changing records management capabilities for Office 365—including labels—that are transforming how SharePoint works as a records and knowledge repository. If you missed the live broadcast, access the on-demand recording today!